In this class we will break down three classic desserts! Each one with layers of techniques and skills. Workshop is led by Pastry Chef Ellen Duke. 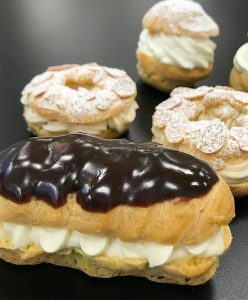 Techniques learned include making light and airy pate choux batter, vanilla pastry cream and chocolate glaze. You will learn to make flaky puff pastry and layer with seasonal berries, pastry cream and chocolate ganache. This creamy custard is baked and chilled, then torched with turbinado sugar for a caramel crust. Workshop begins at 6:00 pm.